Home > Codling Moth > What are Codling Moths? Codling Moths, or Cydia (Laspeyresia) pomonella, is an insect that primarily infests apples, pears, English walnuts and rarely cherries, leaving reddish-brown droppings called Frass. If controlled in the early season with chemical and non-chemical methods, extensive damage caused by Codling Moths can be suppressed to tolerable levels. 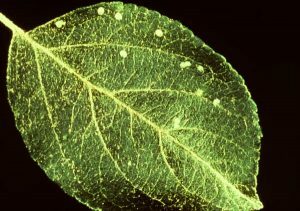 The Codling Moth develops through four stages: eggs, larva, pupa and adult moth. The full-grown larva develops into an adult moth during the winter inside a silken cocoon, pupating on tree trunks under the bark, in the soil or on debris under the tree. The rate of development of the larva inside the cocoon proceeds more rapidly during warmer weather and climates. Mating of the Codling Moths transpires a few days after the emergence of the full-grown insect from the cocoon, which follows impregnation and the laying of eggs. The tendency of laying eggs increases as the temperature increases above 620F during the night. The eggs hatch in six to fourteen days. Within 24 hours of hatching, the larva burrows into the fruit and feed on the internal flesh. They prefer to feed on the developing seeds in the center of the fruit. Once the full-grown larva exits the fruit after physically developing through five larval stages, it seeks safe pupation sites. The fruits that prematurely falls onto the ground during the summer are infested with the first generation of Codling moth larvae. The second generation will follow the first generation that leaves the fruit to seek pupation sites during mid-summer. Depending on the climate, Codling Moths could procreate 3 or 4 generations per year. America, Europe, and Southern Russia. 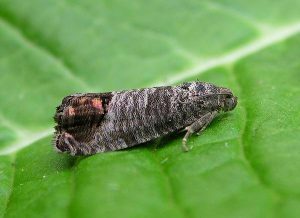 A full-grown adult Codling Moth measures about ½ to ¾ inch long with spotted gray wings with brown tips, which shroud its body. The larvae are white to light pink color caterpillar-like “worms” with dark brown heads. The instar larva is 1/10 inches while a full-grown larva is ½ to ¾ inches. The larval stage is followed by the pupating stage, where the larva creates a cocoon and pupates through winter. An adult female moth lays approximately 30 to 70eggs. The eggs, which get darkened as they hatch, are tiny, disc-shaped and are usually deposited singly on fruits, nuts, leaves or branches. 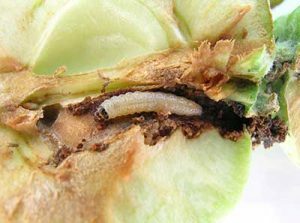 If left unmanaged, Codling Moth larvae can cause extensive damage, often infesting 20%-90% of the fruit. The extension of the damage is often dependent on variety and location of the trees. Codling Moths can be difficult to control if the population has been allowed to build up over one or two seasons. It seems more pragmatic to manage a smaller Codling Moth population than suppressing a dense population. In trees with mild infestation, a combination of cultural controls, that needs to be implemented early in the season, will help to maintain the Moth population to a tolerable level. On the contrary, a dense population might need several effective insecticide applications. consuming. This method should be implemented when the fruit is about ½ to 1 inch in diameter. Although when implemented lonely, hanging Codling Moth traps with pheromones are known to be ineffective, when combined with insecticide treatments, the traps could be effective. Another traditional, non-chemical method for controlling the Codling Moths is Trunk Banding, where the mature larvae are trapped in a cardboard band as they climb the trunk seeking places to pupate. Releasing of the tiny wasp Trichogramma platneri implemented with mating disruption or soft pesticides could be used to manage Codling Moths as a Biological Control. Conventional insecticides to control Codling Moths include products such as Cabaryl, Imidan, Sevin, Permethrin, and Malathion. Moreover, Horticulture mineral oil, organic materials such as Spinosad, Entrust, and products such as Intrepid (methoxyfenozide) and Esteem (pyriproxifen) with low toxicity could be used in lieu of or along with strong toxins. These insecticides are available at stores and online. However, it is precautionary to research and consult a pest control professional before usage of these chemical-based products.